Camille Cabral was born today, March 31, in 1944. She is a French-Brazilian politician and dermatologist. 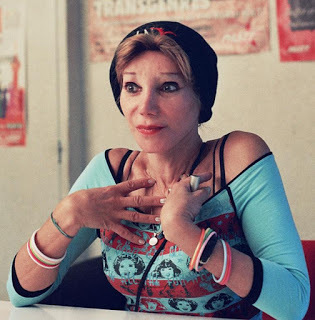 The first transgender woman to be elected in the history of the French Republic (she was on the council of the 17th arrondissement of Paris by the French Green Party), she is also the founder of the non-governmental organisation PASTT – Prévention, Action, Santé, Travail pour les Transgenres (Prevention, Action, Health and Work for transgender community). Cabral was born and raised in Cabaceiras, Paraiba, Brazil, and passed the entrance exam for medicine and studied in Recife. While working as the Hospital das Clinicas in São Paulo, Cabral first started dressing as female. In 1980 Cabral went to France, did an internship in dermatology, and then worked at the Hôpital Saint-Louis in Paris. Here she came out and transitioned. She chose the name Camille when she took French nationality: "I wanted a very French name, but elegant." In 1993, Camille lost her job and in consequence founded the Groupe de prévention et d'action pour la santé et le travail des transsexuel(le)s (PASTT). She also became involved in prostitutes rights, and fought against pimps and trafficking. She was a co-organizer of the Pute Pride march, and of the Red Light co-operative. Camille was elected a list councillor for the Green Party in the 17th arrondissement of Paris and served from 2001-8. She also ran as a candidate in the parliamentary elections.